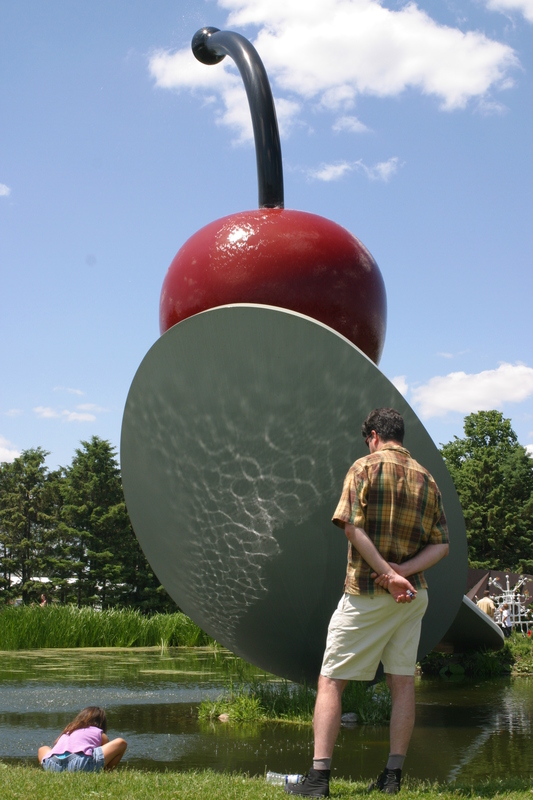 While it’s not quite the same as cherry blossom time in our nation’s capital, it is a special season for Minnesota’s most beloved cherry… and spoon. Every few years it is necessary for the Walker to conduct routine maintenance on the monumental Claes Oldenburg and Coosje van Bruggen sculpture, Spoonbridge and Cherry. This entails nearly two weeks of activity, including fencing off the area, draining the pond beneath the work, and installing special lift and painting equipment. * Once the site is ready, work begins. First the surfaces of both the stainless-steel cherry and aluminum spoon are sand-blasted down to their undercoating (imagine a strong gust of wind leaving you standing outside in nothing but your skivvies!). It takes about three days to study the structure and identify the imperfections that have cropped up due to the elements and age of the work. As each dimple, crack, and fissure are discovered, they are filled and contoured back to perfection. With the work back in “ship shape” (you knew each piece was first constructed in a shipyard before being trucked to Minnesota, right? ), a day is spent applying a fresh coat of primer. Once the primer is dry, the cherry needs to become red again. But what color “red”? Fire engine red? Jungle red? Perhaps cherry red? Well you might be surprised to learn that the true color of this cherry is no less than 73-R0176 (doesn’t it make your mouth water?!). Like the spoon, the cherry is tarted up in a custom color created and approved by the artists. When the cherry is ripe and the spoon gleaming, another day is spent applying a “clear coating” to make the cherry shine as well as to protect it again from the ever-changing elements. Once all is well with the sculpture (…with the cherry on top), the pond is refilled and the equipment removed and you can once again have your photo snapped in front of this unique untensil. Visit frequently to see the work in progress as my colleague Masami blogs on with images. * Who pays for all this hardwork? People who love the garden, that’s who! Visit “Support” at garden.walkerart.org to make a contribution.